It’s cherry season! Besides eating them fresh by the handful, what’s the second best way to enjoy them? Cookies, obviously. 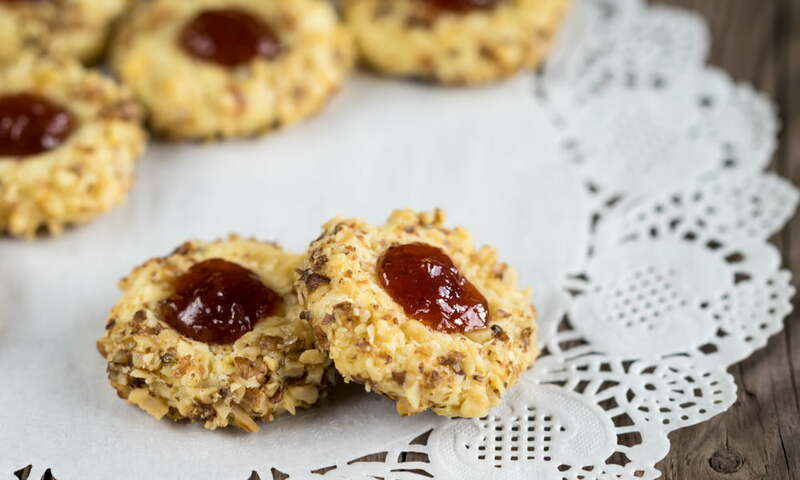 And these vegan thumbprint cookies with our low-sugar cherry jam are just what we’re talkin’ about. You guys loved our low-sugar cherry jam recipe, so we tried to find other ways to enjoy it. These cookies hit the spot. We’re obsessed with them for more reason than one: they bake quickly (so you don’t have to leave your oven on for too long in the summer heat), they’re light, and they’re super easy to make! So, if you’re getting sick of jam on toast (it happens) and are looking for a creative way to use up our jam, you definitely need to give these cookies a try. These cookies are great for summer potlucks, picnics, or as an evening treat – especially when paired with some vanilla ice cream. Now, time to get baking! Optional: ½ cup finely chopped walnuts to coat cookies in. Mix together coconut oil, sweetener, vanilla extract and almond extract. Mix well until creamed. Slowly add almond flour and salt until you form a large doughy ball. Line a baking sheet with parchment paper or a Silicon mat. Scoop tablespoons of the dough and roll into balls. If you’re using walnuts, roll the balls in the walnuts now. Place evenly onto the baking sheet. Make an imprint in the centre of each cookie with your thumb. Fill each imprint with jam, about ½ – 1 teaspoon. Bake for 8-10 minutes at 350 F or until lightly browned. Serve solo, or with vanilla ice cream. Enjoy! Find all ingredients at your nearest Blush Lane!